Front: Bobby McPherson, Emmet Farrell, Willie Nelson and Archie Peters. Not all names were known but most of those were identified from Andy Coogan’s autobiography, referred to below. That the Second World War disrupted athletics and the sporting careers of many fine athletes in many countries and sports is generally accepted: but the fact that it created an artificial stop/start point for historians is perhaps neglected. For instance, the starting point for this website is generally 1945 although in several cases where athletes or clubs had successes that straddled the war. In the case of Maryhill Harriers, to start celebrating the success of a particular generation of runners in 1945 is to miss the rich vein of success that ran from the end of the Twenties right through to the early 50’s and the careers of men such as Donald Macnab Robertson, John Emmet Farrell and Dunky Wright must be looked at across the divide. These men have all been profiled elsewhere on this website but they were only the very tip of the club in which they needed many other good men to have the success they achieved at club level. If we look at the Edinburgh to Glasgow Road Race and start just before the War, in 1937, we get a able like this (bold indicates fastest time on stage). Looking at the National Cross Country Championships for roughly the same period and only looking at the first six (scoring) runners we get this table. 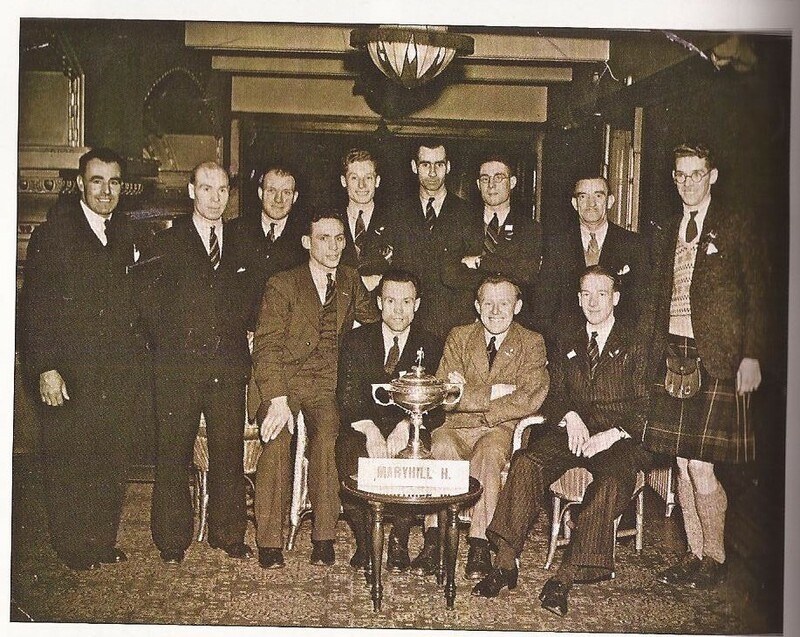 1948 JE Farrell 1 R Mathieson 18 G Porteous 29 J Wilkie 34 H Scholes 36 HB Morrison 40 4th team: 8 points behind third. If it is clear that they preferred the country – and Emmet Farrell was quite clear that he did – they were no slouches on the road either. If we speak of a fast pack, then the runners above did constitute such a one. These are in addition to the many medals won by Emmet Farrell, Dunky Wright and Donald Robertson who are the subjects of separate profiles. Six different men ran fastest times on their stages of the E-G at one time or another. Andy Coogan has not been mentioned here but he was a really good runner and his autobiography “Tomorrow You Die” tells of his time with Maryhill Harriers and love of the sport as well as his time in Japanese hands during the War. Well worth a read – buy it, the money will be well spent, if you can’t buy it, get your Library to buy it and let others get the benefit.